Nineteen games down, six more to go. Franklin & Marshall Women’s Basketball has faced plenty of adversity this season, but still has to time to fight back from their 8-11 season record and break even. 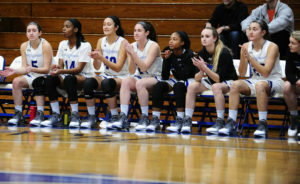 In their game against Swarthmore last Tuesday, F&M Women’s Basketball clenched a 65-57 win over the Garnets of Swarthmore College. F&M’s Ashlyn Peterson scored a game-high 27 points moving the team’s record to 8-9 and 6-6 in the Centennial Conference. The start of the game did begin well for the Dips as Swarthmore jumped out to a 7-4 lead before Peterson’s threes on back-to-back possessions. This gave F&M a 10-7 lead in the first quarter. At the start of the second, the Dips built their lead with six points from Sarah Haddon in the first three minutes. A three from Pilone and a basket from Hamill made it 27-22 with three minutes left in the half. AnnMarie DiCarlo gave F&M a double-digit leading into the half and the Dips never looked back, clinching an important road win. Coming of this important win, the team faced a tough loss at Gettysburg and looked to rebound against Ursinus. The Dips faced yet a tough loss against Ursinus at home this past week, losing a tough one to the Bears by a score of 53-35. Both teams struggled to find the net at the start of the game, with neither providing much offensive output. A three-pointer from F&M’s Haley Pilone with 5:49 left in the first quarter brought F&M within striking distance of Ursinus, who lead the game 6-5. In an action-packed two minutes, the Bears scored a total of eight points, closing off the first quarter with a 14-6 lead. A layup from F&M’s Sarah Haddon started off the second quarter with promise, but another seven-point run by the Bears expanded their lead to 21-8 with a 4:57 left in quarter. Baskets by Kristen Hamill and Erica Brown left the halftime score at 23-12, with Ursinus having the advantage. One more burst from Ursinus extended their lead to sixteen points and a subsequent ten-point response from the Dips brought the game much closer. However, the Dips fell short in their comeback and F&M fell by a final score of 53-35, in what was their fourteenth Centennial Conference game of the season. The Dips closed out a tough stretch of games with a game against Muhlenberg and they lost 79-47. The team will return to the court this Tuesday with a home game against Johns Hopkins at 7:30 p.m. As the team makes a push for the playoffs, come out and watch the F&M Women’s Basketball team as they take on the Blue Jays in what will be a crucial sixteenth conference game of their season.